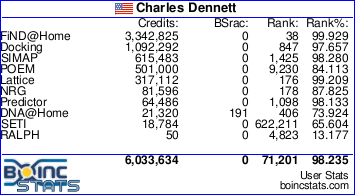 I've created a new set of work units from DNA@Home using a new data file (from human genome revision 19 -- hg19). These should run a bit longer than the other work units, so please let me know if the time estimates and credit is okay. They're actually not as long as I'd like them to be, so depending on how things are working work units after this could be 10x longer. Estimated run time on my computers is 10 to 14 minutes, so I will see how they run. Message 3260 - Posted: 8 Sep 2014, 22:24:28 UTC - in response to Message 3259. Okay that's not too bad, if it's accurate than I can make them 10x longer without much of a problem. Didn't want these to run too long because I wanted to make sure they wouldn't crash and validate correctly. On my fastest system they are estimated at 10 minutes or so. So far one has completed and it was done in 93 seconds cpu time. The next one is at 50% complete with about 43 minutes of cpu time. Quite a difference. So, right now the estimate is 90 minutes or so for this one. Not sure why it's taking so much longer. This is a 4 core system running Linux. There are three other tasks running and they appear to be in line with the one that's half done. Time will tell. Message 3262 - Posted: 8 Sep 2014, 23:14:14 UTC - in response to Message 3261. Strange, there's probably an error with the one that took 93 seconds. Was it a test_hg19 work unit or something else? 90 minutes sounds more right for the test_hg19 work units. A double check of that fast one shows it was a leftover from the last batch of small ones. Must have been stuck. It was created earlier today. So, the time estimates for the new batch seem to be very low. They come to me with an "estimated completion" time of 9:25. They are completing at around 50 minutes on this rig. I'll run them overnight and see how it goes. Tasks seems to have a validate horror, any validator bug? What is the check-pointing set at for these??? Seems to be at 50% ??? I thought check-pointing was done by time, not percentage? I have validate errors on all completed tasks that are not pending. I think I will abort all these and wait until further news. I noticed a huge memory increase while running these... related? Message 3267 - Posted: 9 Sep 2014, 1:31:36 UTC - in response to Message 3266. This will take a whole lot more memory as the input file is quite a bit larger. Let me check out the errors. Checkpointing is done by the number of iterations the application does. Since I set it to do 10000 total iterations and it was previously checkpointing every 5000, 50% looks right. I should probably make it checkpoint more frequently, maybe every 5% or so. Message 3268 - Posted: 9 Sep 2014, 1:33:00 UTC - in response to Message 3267. Message 3269 - Posted: 9 Sep 2014, 1:43:05 UTC - in response to Message 3260. They are taking just over an hour (between 3,994 and 4,248 seconds) to actually run. Four so far returned with two pending and two with Validate Errors (along with my wingmen). Message 3272 - Posted: 9 Sep 2014, 2:46:59 UTC - in response to Message 3268. Stderr of invalid task (validate error) doesn't show any error, it seems to be validator bug. Message 3273 - Posted: 9 Sep 2014, 2:50:39 UTC - in response to Message 3272. Actually what's happening is the stderr is too long, so it's cutting off information the validator needs to validate things.